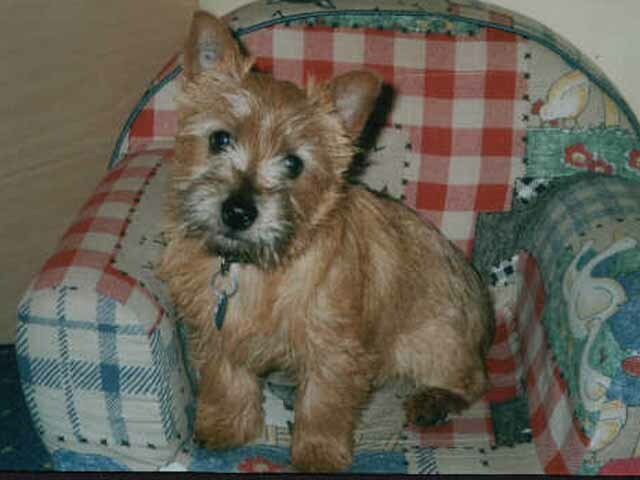 Small and stocky, the Norwich Terrier is most easily distinguished from the Norfolk Terrier by its pricked, rather than dropped ears. Its skull is broad and slightly domed, and adorned with erect, wide set ears. A strong jaw set defines its wedge-shaped muzzle, and its large teeth have a scissors bite. Dark, small, oval eyes give a foxy expression. A medium length neck tapers into laid back shoulders and a short, level topline. The wide chest is deep with well sprung ribs. Its docked tail is level with the topline and erect. The forelegs should be straight, and the hind legs should be muscular with low set hocks. Its wiry, straight coat lies close to its body, with slightly longer hair around the neck and shoulders. On the head, ears and muzzle, the hair is short and smooth, with eyebrows and whiskers. Coloring may be wheaten, red, black and tan or grizzle. 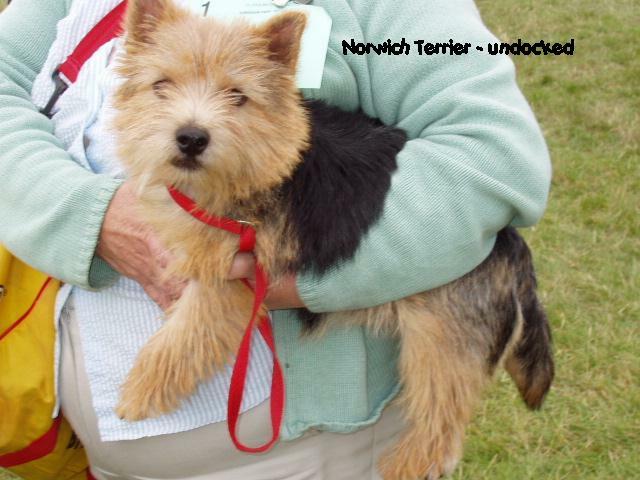 Common Misspellings Norwich Terier, Norwik Terrier, Norwhich Terrier, or Nor Wich Terrier. All around good-natured, it gets along well with children and other pets, and will not usually be shy or aggressive with strangers. This breed loves companionship and is eager to please. 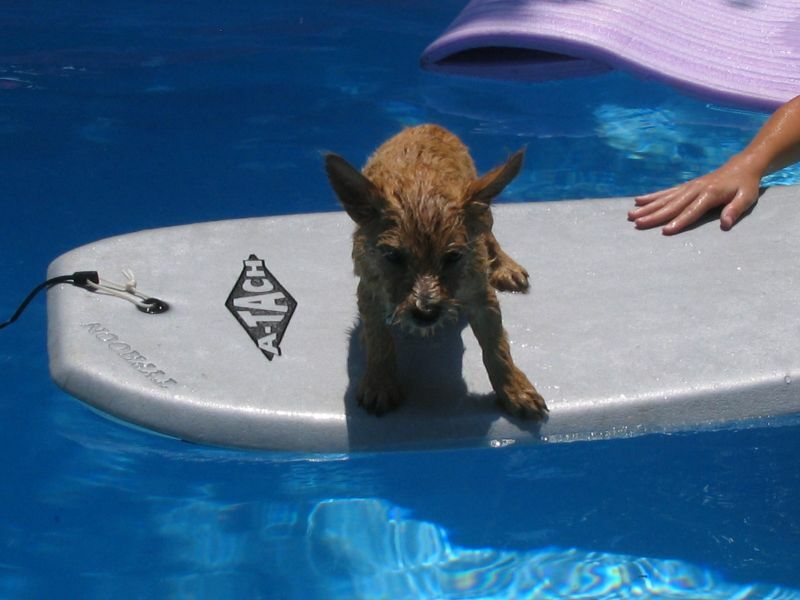 However, like most terrier breeds, it can be independent and willful. It is very active, and loves to play, especially with toys and balls. If it is not occupied, it may bark or dig. Socialization during puppyhood is critical, especially with cats, strangers and other small animals, or your Norwich may become a nervous pet. Housebreaking may be hard, but firm and consistent rules will ease training difficulties. 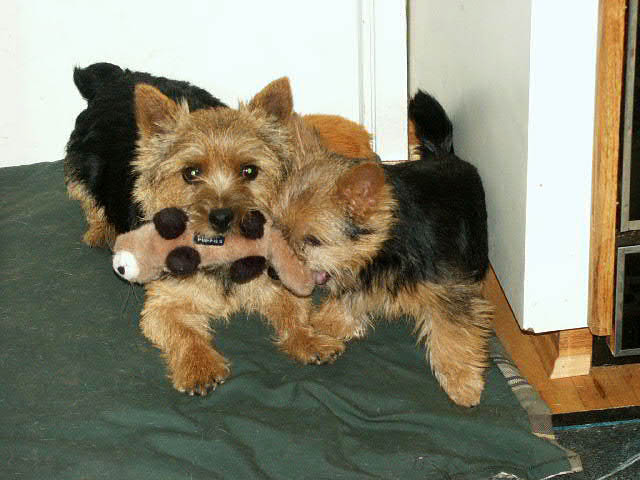 Do not allow this dog to run without a leash unless it is in a secure area, as it loves to give chase to small animals. 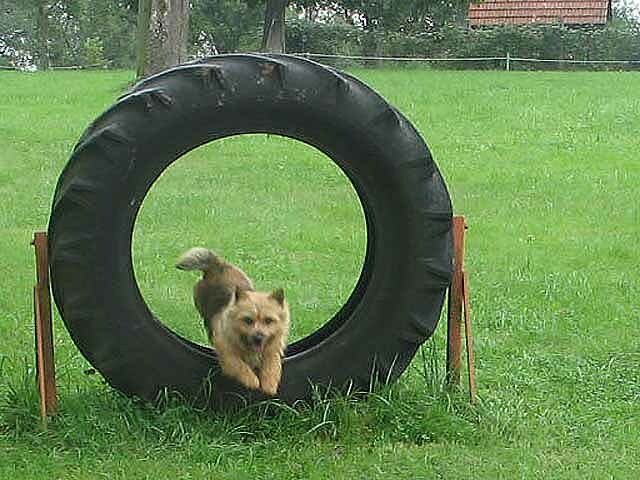 Those familiar with both the Norwich and Norfolk Terrier say that the Norwich is a bit more affectionate and easier to train than the Norfolk. Failure to adequately meet the exercise needs of this breed may result in destructive or neurotic behavior. 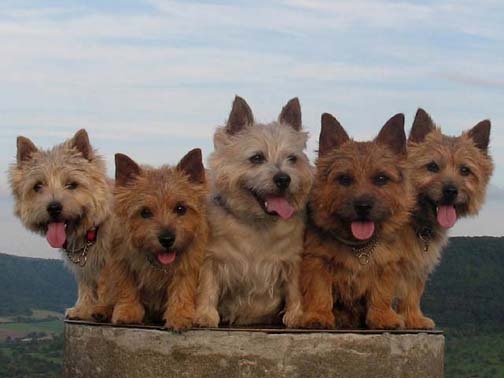 The Norwich Terrier can thrive in an apartment, but only with regular activity. Brush at least once a week to avoid matting, and bathe only when necessary. Stripping the coat a few times a year will improve appearance and promote healthy skin. This dog should sleep indoors. 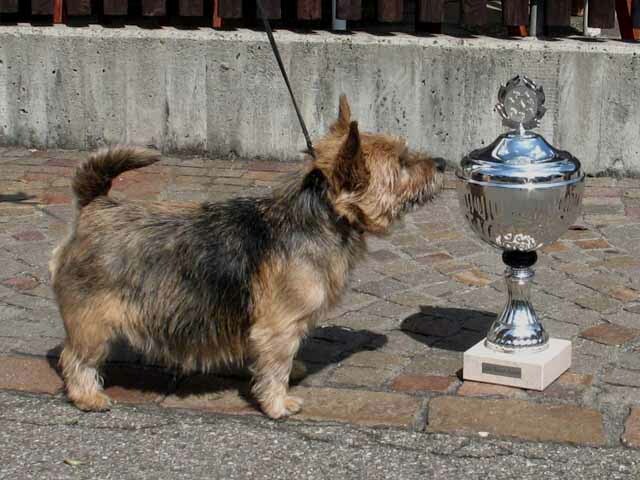 The Norwhich Terrier is vulnerable to canine hip dysplasia, patellar luxation, allergies and seizures. Around the turn of the century, one of these Trumpington Terriers (as they were then known), Rags, was moved to a stable near Norwich, England, where for two generations he and his progeny were bred to other terriers. 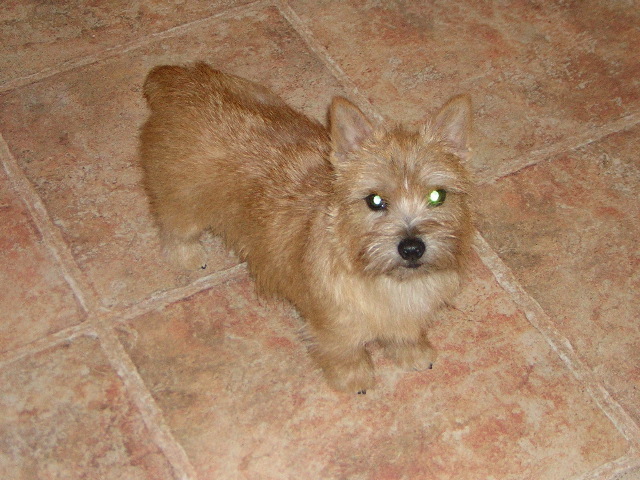 The Norwich Terrier developed from this breeding. 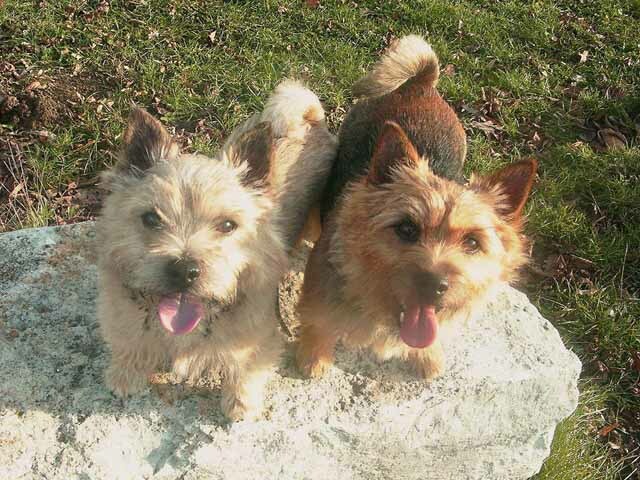 In 1914, a Norwich Terrier named Willum was introduced to America. The breed was officially recognized by the English Kennel Club in 1932, and by the American Kennel Club in 1936. In 1964, the English Kennel Club separated the dropped ear variety of Norwich into a separate breed, the Norfolk Terrier, and the American Kennel Club did the same in 1979. Since then the two have become visually distinct. 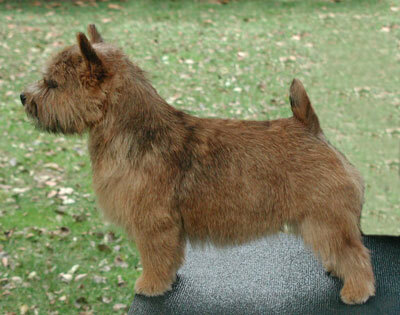 Today, the Norwich Terrier is a serious competitor in the show ring and a modestly popular house pet.